Veeam Veeam Availability Console (VAC) 2.0 released a few days back brings simplification for service providers. While the main target is service providers, the solution can also be installed within an enterprise, on-premises, locally. The product has been in beta stage for a while, but the good news is that is finally here, and for free. Veeam has been working on their Update 3 of Veeam Backup and Replication which will bring some major new features, such as Windows and Linux Agents management within the main backup product and their automatic deployment and config. The agents can be deployed not only on local networks but also remote ones. 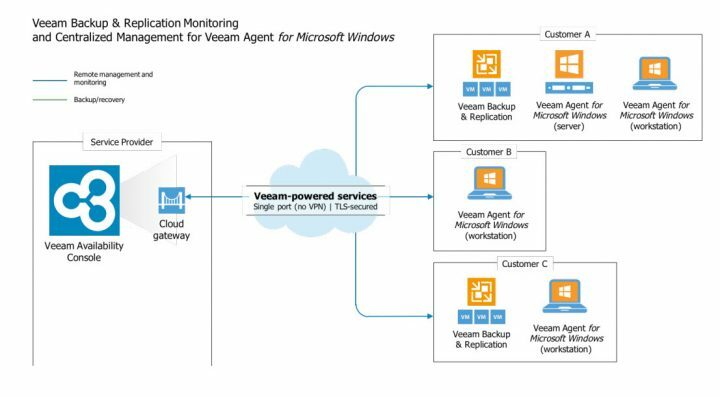 Veeam VAC allows centrally monitor for backup, replication and copy jobs, but also run failover plans, has a reporting capability allowing you to have an immediate status of the whole environment. The product's architecture does not require the use of VPN which greatly simplifies the deployment and initial planning. 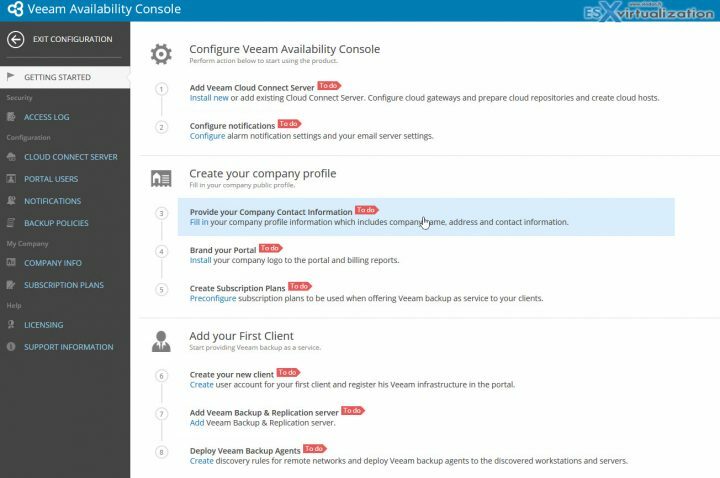 To communicate with managed machines at the remote sites, VAC utilizes a cloud infrastructure implemented with Veeam Cloud Connect (VCC). Overview of the VAC's architecture below. As you can see, the product can be used for many scenarios. Below you see an overview of 3 customers where the first one has an architecture with dedicated Windows Server architecture coupled with vSphere/Hyper-V environment, the second one needs just to protect some laptops. Third customer (C) has also vSphere/Hyper-V environment with some laptops/workstation protection. Automated deployment, configuration and management of Veeam backup agents – You can automate deployment and configuration of Veeam backup agents on computers in local and remote networks, manage backup jobs, and monitor the status of data protection operations in environments protected with Veeam backup agents. Centralized monitoring and management of Veeam Backup & Replication – You can manage Veeam Backup & Replication jobs configured to protect virtual machines, run failover plans, monitor and report on the status of data protection operations in virtual environments, or connect to backup servers remotely. Resource management and monitoring for Veeam Cloud Connect – You can allocate cloud repository and cloud host resources to store backups and replicas created with Veeam backup agents and Veeam Backup & Replication, monitor and calculate the cost of resources provided with Veeam Cloud Connect. 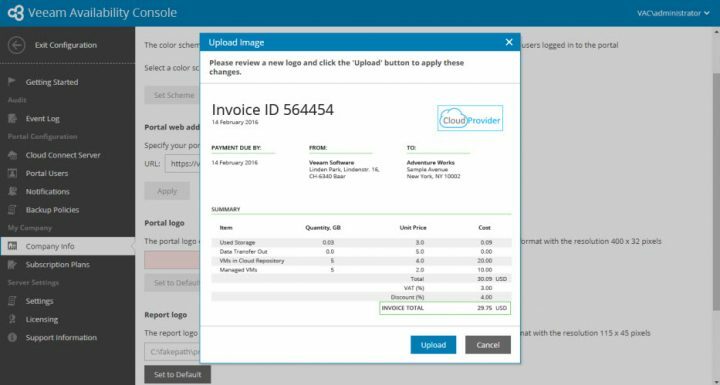 Streamlined billing, chargeback and reporting – You can automate billing or chargeback operations for provided backup services, and create backup reports showing whether you meet established RPO requirements. The product Management UI looks like this (view from the lab where I run the pre-release build). You can see that the configuration screen guides you through the necessary steps when it comes to initial configuration and branding options. Create a recurring revenue for your company. Joining the service provider program is Free. Once you get approved, you get rental keys license. You can do that from the Veeam VAC web page. Billing your customer on regular basis allows you to get a revenue-based each month and bill the customer according to what the customer really uses. 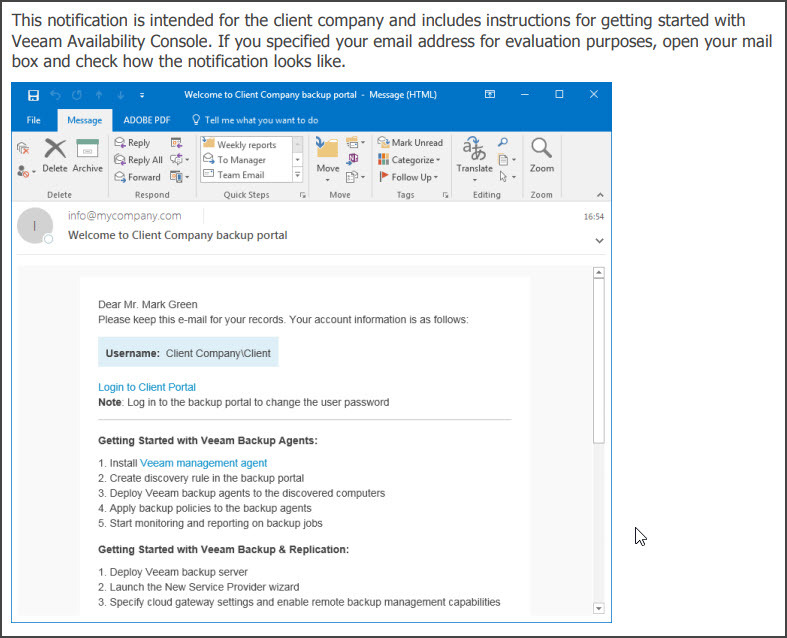 Below here is a screenshot of a Veeam VAC evaluation guide. Note that this is just one of the examples. I don't like this word (who know why) but it perfectly fits what Veeam does. If you're familiar with VMware vCloud Director concept it's basically the same. A complete isolation between clients and client's environments. Veeam service provider has the possibility to manage many clients and their data is completely isolated from other clients. Each client has its own web-based portal which allowing them to monitor their own backups and check the detailed info about their consumption. Veeam goes further with the integration of VAC and the client's management by creating an email template which VAC will send to the customer with all the information necessary to get started with the customer management portal. The main piece of software which handles the deployment is Veeam Master Agent. The master agent is VAC's management agent running on Windows machine in the client's company infrastructure. The agent collects information about the computers discovered within the client's infrastructure, installs the management agents on to the client's computers. One of the first steps is to do is create a rule for deploying automatically the Veeam Agents within an infrastructure. This can be a rule to pick only a certain Windows Active Directory (AD) organization unit (OU) where you want to “push” the agents. Another option for the Agent's deployment can be a network discovery or CSV import. You can also deploy the agent via Microsoft Group Policy Object (GPO). In order to prevent users to change the setting of the backup agent, Veeam has the option to set a Read-only mode. In the read-only access mode, Veeam backup agents can be managed only in Veeam Availability Console. User cannot change any settings for the backup job. 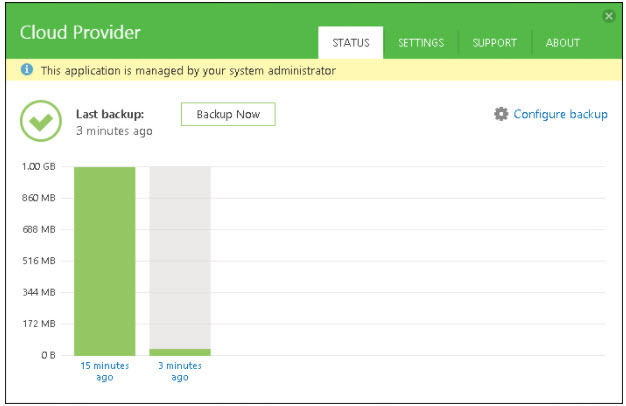 The Veeam backup agent Control Panel section displays a notification saying that the product is managed by a system administrator. The end user can, however, start a backup manually or restore individual files without bothering the system admin to do that. The documentation set has detailed PDFs for deployment and installation or for evaluation purposes with several use cases. Really easy to follow. Detailed documents for day-to-day administration.